When it comes to vacations, more Americans than ever are taking along their four-legged companions. A recent study by Trip Advisor found than more than half of pet owners in the United States take their cats and dogs with them when they travel. The results of this study are not surprising to anyone who shares their home with a pet. After all, dogs and cats are part of our families — why should we not take them with us when we hit the road? The good news is that there are more pet-friendly travel options than ever before, with hotels and rental home owners offering accommodations for most pets and more alternatives for other types of travel with pets. But even with these additional choices, a smart pet owner will take advantage of these tips to make the most of traveling with pets. While traveling with pets can be fun, a poorly-planned trip can be stressful for your cat or dog — and potentially disastrous for you. That is why it is so important to spend time getting both yourself and your pet ready for travel. Start with a consultation with your veterinarian. This can be done at a regular check-up, or at a special appointment if you have any particular health concerns. Your vet can address your pet’s overall health and ability to travel safety. He or she should also talk about things that you should watch for at a particular location, such as how hot sand at a beach may affect your dog’s paws, or how being isolated in a crate while may create anxiety for your pet. Tell your vet where you will be traveling and how you will get there, and ask for tips on how to make the experience a successful one. You may also want to consider asking your vet for a microchip, which can help locate your pet in case he or she is somehow lost during transit. Next, stock up on gear to help ensure that your pet is comfortable and well-nourished during the trip. If you’re driving, put together an emergency first-aid kit for your pet, similar to what you likely have on hand for humans. This should include tweezers, gauze and a strip of fabric that could act as a muzzle if your pet is hurt or could be used to bind a wound until a veterinarian can treat an injury. A spill-proof water bowl is a must for both air and car travel, so that your pet can remain hydrated as he or she travels. In addition, make sure that you have food available for your pet, which can be given in collapsible bowls. You should also consider purchasing some type of calming aid to help your dog or cat remain calm on the plane or in a car. Popular brands include Adaptil for dogs and Comfort Zone Feliway for cats; experiment with a few brands in advance to see what works best for your pet. A favorite toy or blanket can also help to keep your pet both calm and occupied. If you’re driving in the car, you should purchase a restraint harness that allows you to buckle your pet into your vehicle. This will keep both you and your pet safe, as it will prevent them from jumping onto you while you are driving, and will keep them secure in the event of an accident. Finally, your travel kit should include items such as bags to clean up after your pet, disposable litter boxes, and wipes to help keep your pet clean and happy while traveling. Finally, do a trial run so that you know how your pet will handle a long trip. 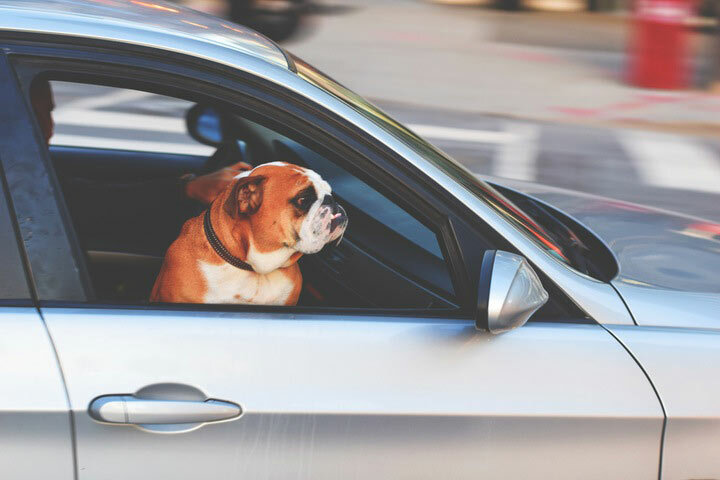 Your pet may be used to short trips around town, but may not be accustomed to spending hours cooped up in a crate or inside of a moving vehicle. While it may not be practical to drive your pet around for hours or to book him on a short flight, you can get your dog or cat used to a crate or to wearing a harness. Take your pet on a few slightly longer trips to determine if they get motion sick or anxious. You can then use this experience to better plan for a longer trip in the future. When it comes to traveling with pets, driving may seem to be the easiest option. Your dog or cat can get out often, can be right with their humans, and won’t be around other strange pets. But even driving in a familiar vehicle can be stressful for a pet, particularly on longer car rides. That is why you should always take care to prepare well in advance of any road trip with a pet. While it may seem silly, pets should always be restrained while in a vehicle. This will prevent driver distraction and injury to your pet. In an accident, an unrestrained pet can be seriously hurt or even killed. Even if you do not collide with another vehicle, a quick stop or a sharp turn can throw your pet around, resulting in injuries. There are numerous choices available for keeping your pet safe while in a vehicle. This can include a pet seat belt (safety harness), a car seat specifically designed for pets, a pet barrier, or a travel crate. Find a solution that works for you and your pet ahead of time; it will help to keep you both safe and happy while on the road. Next, make sure that you have plenty of food and water for your pet while on the road. Even in an air-conditioned car, your pet may get thirsty. Keep a gallon of cold water ready to offer to your pet, ideally in a spill-proof bowl so that your pet can drink during the trip. Plan for regular stops to let your pet take a bathroom break and get some exercise. Remember that a tired pet will often sleep through travel, so make sure to play with your pet or take him for a walk before getting into the car, and take advantage of rest stops to let your dog or cat get some fresh air. Don’t forget to pack a leash to make sure that your pet stays safe in busy rest stops and picnic areas! Finally, follow common sense safety precautions to keep your pet healthy while traveling. Never leave your pet in the car on a warm day. Even with the windows cracked, the temperature inside of a car can quickly reach lethal levels. Always bring your pet with you when you leave the vehicle, and if you aren’t going to a place where your pet can be, consider other alternatives to traveling with your pet, such as a kennel or staying with family or friends. When it comes to traveling with pets via plane, the key is advance preparation. You likely will not have contact with your dog or cat while en route, so be sure to do everything that you can in advance to help them get through the flight comfortably and safely. First, carefully consider whether your pet is able to fly. Older cats and dogs, puppies and kittens and pets with health issues may not be able to fly. In those situations, it is best to leave your pet at home rather than risk problems on the flight. You should also thoroughly research airlines before booking a spot for your pet. Some airlines have a higher incidence of pets being lost, or of dogs and cats suffering injuries or even dying on flights. Your research should also include looking at the rules and regulations for each airline; some may have specific requirements for travel that you cannot meet. If you are concerned about putting your pet on a regular flight, consider booking a flight on an airline that caters to pets, such as Pet Airways. Once the travel has been planned, you should get everything in order for the flight itself. This includes gathering all necessary documentation, such as proof of vaccination, and making sure that your pet has an ID tag and/or a microchip to reduce the risk of your dog or cat being lost. Next, prepare the pet carrier for travel. Make sure that your pet can stand in the crate, and have him or her spend some time in it beforehand. Purchase spill-proof water and good containers, and make sure to have familiar bedding and toys available. On the day of the flight, be sure to take your pet for a walk or play with him or her beforehand to help them relax and get some exercised before putting them into a crate. This may help them sleep during the trip, which will make the process less stressful for them. By taking these basic precautions and preparing in advance of any travel, you can help to ensure that traveling with pets is successful for both you and your furry companions. If you believe that your pet may not be able to handle a long trip, consider contact a pet care professional about pet walking or sitting services while you are away.